We all love Elephone for the good design of their models, even though it largely repeats the more successful gadgets. The developers have released a more affordable version of the A6, which was called the Mini. The mini version has a new budget processor, which significantly affected the appeal. The new budget smartphone Elephone A6 Mini seems to be ready to go on the market Soon. It seems that Chinese manufacturers seem to prefer to make low-end smartphones with water-drop screens. 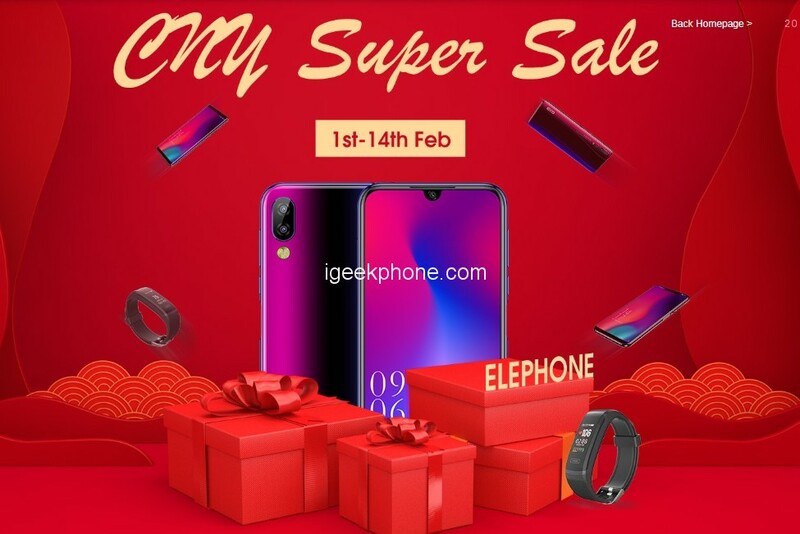 Now it is ready to hit the market and Elephone is offering a $20 off coupon on the reservation activity. Besides the A6 Mini, more devices are also on promotion, including U Series, A4 Series, and Elephone A5. 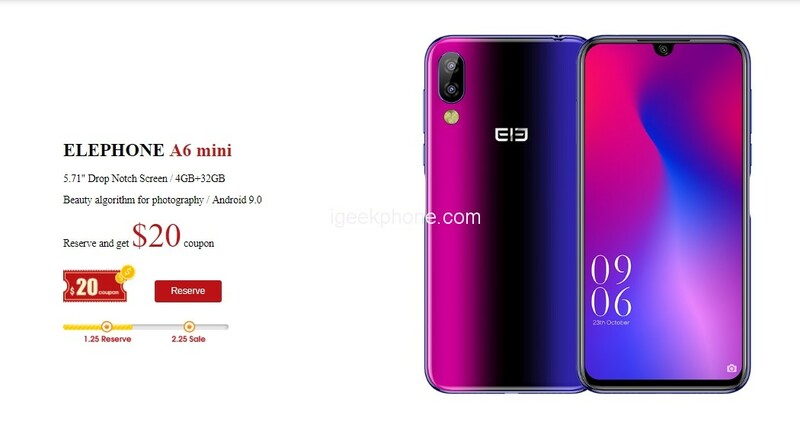 Elephone A6 Mini features a 5.71″ waterdrop notch display and this means that the overall size of the device will be quite compact. The rear panel will host a dual camera setup with 16MP/2MP sensors while the notch on the front panel makes some space for the 16MP selfie shooter. As for other features, there is a side-mounted fingerprint sensor and support for face unlock. The device runs on Android Pie, the latest OS from Google. Elephone A5 as a phablet features 6.18-inch FHD+ display afford you a vivid and different visual experience. 12.0MP + 5.0MP + 0.3MP back camera and 20.0MP + 2.0MP front camera, you can enjoy images with high resolution. It comes with most of the features we’ve come to expect from a phablet, including 4GB RAM and 64GB ROM storage equipped with Android 8.1 OS that you can play games faster. 4000mAh battery can keep working a long time. Elephone A4 Pro is with 5.85-inch HD+ display affords you a vivid and different visual experience. 16.0MP+8.0MP front and rear cameras, you can enjoy images with 1512 x 720 high resolution. It comes with most of the features we’ve come to expect from a phablet, including 4GB RAM and 64GB ROM storage equipped with Android 8.1 OS and 3000mAh big capacity battery so that you can play games faster. Next Article Unboxing & review of Coolbaby X9 – A PSP clone at a very low price, with 20000 games!